As always, time is flying. I'm slowly getting the yard ready for summer. I got the bed by the end of our deck, weeded and munched just in time for a friend's return. Many cringe seeing this but I've come to learn how helpful they are. 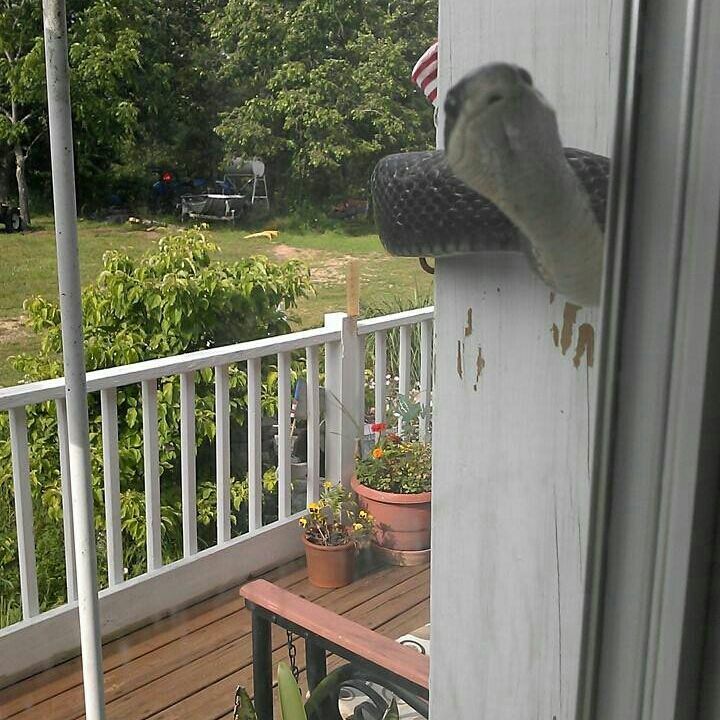 IT was here last year and I got a much commented on photo of, what I think was the same snake, looking in our living room window while hanging on the shepherd's hook that holds the hummingbird feeder a year before that. Maybe 4 years ago I took a pic of it partially laying on a cedar bench near the garden. So, since they were all about the same size, between 4 and 5 ft long, I think it's the same snake. I have noticed there weren't any mice in the house this spring. :) It's quite the Helper!! Not sure how this blog will look since I'm using my Kindle and have just added my photos to My Cloud. Woohoo! Learning new things is good for my old brain! Now, if I could only update my Kindle 's browser. Ha ha. These Black snakes prey on little varmits AND venomous snakes like our native Copperheads. I haven't seen any of those around here in years!!! Lucky you that snakes do not trouble you! I lived with snakes most of my life and they do not give me the willies!